Olive oil is very effective to heal brittle and cracked nails. Olive Oil penetrate the cuticles, and it provides a protective coating on the surface of the nails and prevent them from cracking. Soak your nails in olive oil for 15 minutes and then rinse off with lukewarm water. Olive oil helps to strengthen the nails and keep them healthy and moisturized. An other effective way to treat brittle and cracked nails is to use vegetable oil (canola or safflower oil). Dip a cotton swab in vegetable oil. Now, rub the soaked cotton swab on the top and underside of your finger and toe nails. Massage your nails gently, for about five minutes. Repeat this process thrice per day.Vegetable oil soften the skin around the nail, keeping it from drying and tearing. The nails are less likely to break or split if they are kept moisturized. Lack of calcium in your diet is one of the main causes of brittle and cracked nails. So try to include calcium-rich food in your diet. Nuts, seeds, and pulses are good sources of calcium. Celery and broccoli have high amounts of calcium in them and they can be eaten raw or cooked.Almonds are another good source of calcium. Soak 5-7 almonds in some water overnight.Early morning Peel them off and have them on an empty stomach. Deficiency of essential vitamins like Vitamin A, B,C and D also results in brittle and cracked nails.Vitamin Rich foods that are best for nails include poultry, seafood, low fat dairy products, eggs, green leafy vegetables, nuts, beans, bananas, carrots, squash, pumpkin, sweet potatoes, citrus fruits (grapefruit, orange, kiwi, strawberries) and whole grains. 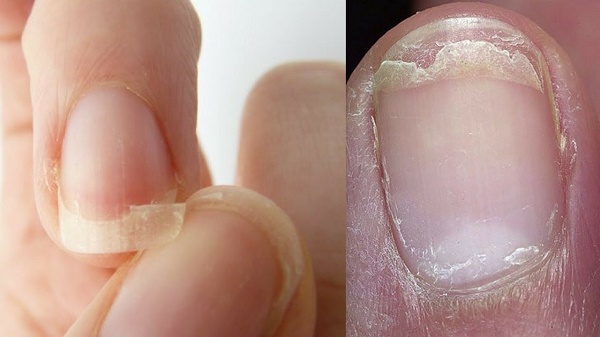 Brittle nails may be caused by dehydration. Drink plenty of clear fluids, especially water, every day. Avoid sugary drinks, because the sugar content in them tends to make the nails more brittle and slow down the healing process. (i)Do not trim your nails deeply because it may damage them and may even lead to infection. (ii)Never use your nails as tools for opening a jar, or a can of soda. The excess pressure weakens them and makes them brittle. (iii)Do not use nail polish removers or acetone too frequently as this too can damage your nails and make them brittle. (iv)Wear gloves to protect your hands and nails while working with detergents and other cleaning products. (v)Cut down on the amount of sugar your eat.Sugary snacks delicious to eat but they can create a barrier to the good nutrition that you eat for your body to absorb. (vi)Hand soaps and detergents can dry your skin, dryness is one of the leading cause of cracked nails so moisturize your hands immediately after washing them.